This text was originally featured on the OpenAIRE Blog. We thank OpenAIRE for allowing us to republish, the original post can be found here. 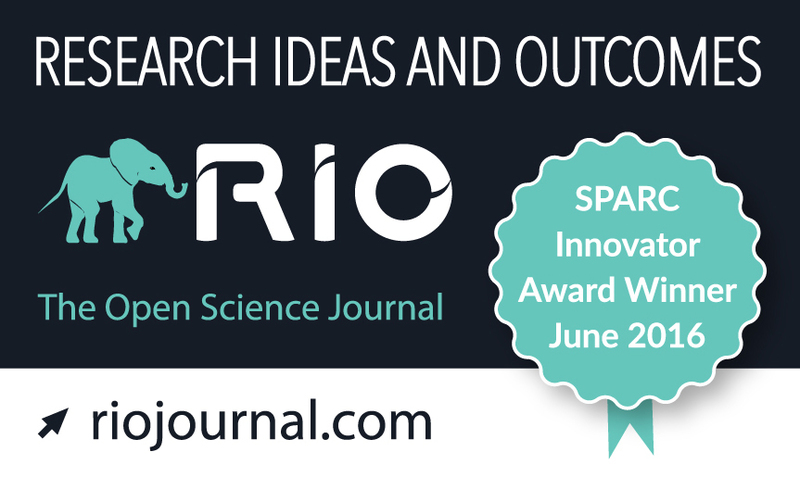 A recent SPARC Innovator award winner, Research Ideas and Outcomes (RIO) was built around the principles of open research in scholarly communications. Traditionally, a research project ends up with just a few articles published in scholarly journals after many years of work. But why communicate just research articles at the end of a cycle? Research articles are just a small component of the research cycle. What about all the other project outputs – research ideas, grant proposals, methodologies, data, software, policy briefs and others? At RIO we want to publish the full research cycle, all in one place, with ‘Collections’, to encourage re-usability and effective open knowledge transfer. RIO offers a wide range of publication types to cover the needs of each research project. Flexible article templates are tailored to provide an easy fit for project outcomes, including H2020, FP7, NSF, NIH, DFG, FWF and other Grant Proposals, Case Studies, Project Reports, Data Management Plans, Data Papers, Software Descriptions, Workshop Reports, Policy Briefs, Conference Presentations and Posters, and many more. Collections can be opened for each project, where project results, including interim ones, are officially published in both human- (HTML, PDF) and machine-readable (JATS XML) formats, assigned a DOI, collected, archived, made discoverable, easily citable and openly available to everyone. To ensure longevity and compatibility with Horizon 2020 recommendations for open access, all RIO publications are also automatically archived in ZENODO (in both PDF and XML) on the very same day. RIO is also integrated with OpenAIRE and the CrossRef’s Open Funders Registry meaning that authors can choose to tag both funders and projects in their articles. The workflow is highly-beneficial – automatically linking funders to publications via API, whilst at the same time directly adding RIO articles to project and funder output lists, browsable on OpenAIRE. This comes packed with additional innovation, thanks to the ARPHA Journal Publishing Platform. ARPHA (Authoring, Reviewing, Publishing, Hosting and Archiving), is the first ever online collaborative journal publishing platform that supports the full life cycle of a manuscript, from authoring through submission, peer review, publication, dissemination and updates, within a single online collaborative environment. ARPHA includes a What-You-See-Is-What-You-Get (WYSIWYG) authoring tool. It allows authors to work collaboratively on a manuscript with their co-authors, and one can also invite external contributors, such as mentors, pre-submission reviewers, linguistic and copy editors. The authoring tool is fully integrated in the publishing workflow so there is no need for a ‘typesetting’ stage or ‘page proofs’ – we have eliminated this inefficiency. What the authors see, is what the reviewers and editors see, and is what will be published. At other publishers, errors and delays are often introduced by the need for a typesetting process – we therefore offer a more efficient and timely system. The platform lays the infrastructure for RIO’s transparent three-stage peer review: (1) author-organized,pre-submission, during the manuscript authoring process in ARPHA (2) community-sourced, post-publication, and (3) journal-organised, post-publication (optional), to ensure quality-controlled, efficient publication and dissemination. Emphasis is put on the societal relevance of research by mapping research outputs to the United Nations’Sustainable Development Goals (SDGs) for each published output. All this comes with an affordable pricing model, which offers tailored packages for projects and individual researcher needs. For individual publications an à la carte pricing model gives authors the opportunity to select only the publishing services they need, thus providing flexibility in the final price they pay. The large-scale FP7-funded EU BON project: Building the European Biodiversity Observation Network is one of the first to try out our Collections feature. 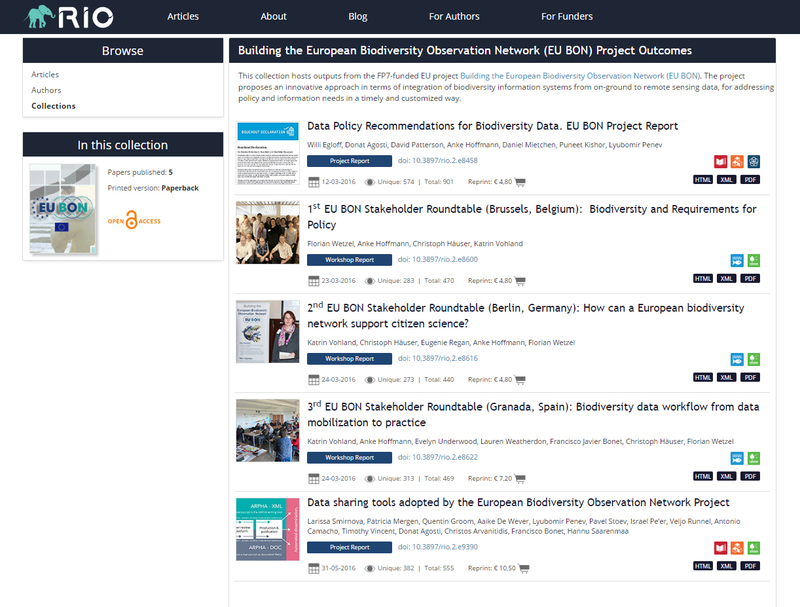 The EU BON Collection at RIO is a great way for the project to showcase and link-up all the important published outputs in the same place, openly available in a variety of formats, at the click of a button. Be our next open research pilot! If you are feeling inspired and see the potential of publishing more of your project results, RIO invites you to enquire about publishing a pilot Collection with us. We welcome suggestions from all fields of research, not just the sciences. The journal will support a limited number of FREE project output Collections. Apply now to be one of the first fully open access research cycles! Interested project co-ordinators can contact us at rio@riojournal.com outlining initial output proposals or a Collection of project outcomes they would like to publish in RIO.